Netflix is offering studios up to $100K per episode for permission to stream current episodes of television series, much to the dismay of the networks that now air them. Netflix is poised to deliver 300 million streams in the upcoming year, all of movies and seasons-past television. CEO Reed Hastings wants to strengthen the company's foothold in television, and has started to talk directly with studios about getting its hands on episodes of currently running seasons of primetime television series. Netflix is reportedly offering studios between $70,000 and $100,000 per episode to gain access to current programming. That Netflix is going directly to the studios, rather than broadcast networks, means trouble for those networks. A third-party service streaming current television could be a sizable threat in a rapidly evolving entertainment industry. This has produced a debate over who owns streaming rights. The New York Post supplies both sides of the debate, noting "the studios that supply the networks with shows argue they own the streaming rights to in-season shows." The Post continues "but the broadcast networks that make a profit from repeats -- and stand to lose audiences, ad dollars and syndication revenue if viewers can see those same episodes on Netflix -- argue they control the rights." 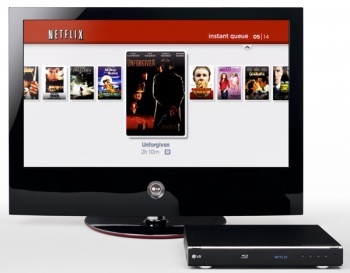 Netflix has recently announced a streaming-only service at $7.99 per month. This puts them at the same price point as Hulu Plus, which streams current episodes of selected series. Hulu is able to stream this content because it is actually jointly owned by the NBC, ABC, and Fox television networks. While Netflix does not currently have access to this timely content, it is the only streaming service of the two, for the moment, that can be viewed on a gaming device, as it allows viewers to stream television on a PlayStation 3, Xbox, or Wii. All of this only applies to television viewers in the United States for the time being, but one of the speculative reasons for introducing the streaming-only Netflix option was that shipping discs internationally was difficult. Following that logic, one hopes that Netflix will soon bring their streaming services to countries outside the US, as they did in Canada earlier this year.